What this equation says is that all the sodium chloride that enters the aqueous solution ends up as Na+ and Cl- ions; there are no undissociated NaCl units in solution. Figure 1 An arrangement for distinguishing between electrolytes and nonelectrolytes. A solution’s ability to conduct electricity depends on the number of ions it contains. (a) A nonelectrolyte solution does not contain ions, and the lightbulb is not lit. (b) A weak electrolyte solution contains a small number of ions, and the lightbulb is dimly lit. 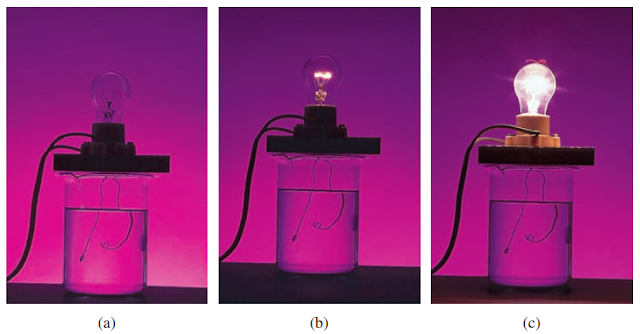 (c) A strong electrolyte solution contains a large number of ions, and the lightbulb is brightly lit. The molar amounts of the dissolved solutes are equal in all three cases. Table 1 lists examples of strong electrolytes, weak electrolytes, and nonelectrolytes. Ionic compounds, such as sodium chloride, potassium iodide (KI), and calcium nitrate [Ca(NO3)2], are strong electrolytes. It is interesting to note that human body ﬂuids contain many strong and weak electrolytes. Water is a very effective solvent for ionic compounds. Although water is an electrically neutral molecule, it has a positive end (the H atoms) and a negative end (the O atom), or positive and negative “poles”; for this reason, it is often referred to as a polar solvent. When an ionic compound such as sodium chloride dissolves in water, the three-dimensional network of the ions in the solid is destroyed, and the Na+ and Cl- ions are separated from each other. In solution, each Na+ ion is surrounded by a number of water molecules orienting their negative ends toward the cation. Similarly, each Cl- ion is surrounded by water molecules with their positive ends oriented toward the anion (Figure 2). The process in which an ion is surrounded by water molecules arranged in a specif c manner is called hydration. Hydration helps to stabilize ions in solution and prevents cations from combining with anions. Figure 2 Hydration of Na+ and Cl- ions. in which CH3COO- is called the acetate ion. (In this book we will use the term dissociation for ionic compounds and ionization for acids and bases.) By writing the formula of acetic acid as CH3COOH we indicate that the ionizable proton is in the COOH group. The double arrow ⇌ in an equation means that the reaction is reversible; that is, the reaction can occur in both directions. Initially, a number of CH3COOH molecules break up to yield CH3COO- and H+ ions. As time goes on, some of the CH3COO- and H+ ions recombine to form CH3COOH molecules. Eventually, a state is reached in which the acid molecules break up as fast as the ions recombine. Such a chemical state, in which no net change can be observed (although continuous activity is taking place on the molecular level), is called chemical equilibrium. Acetic acid, then, is a weak electrolyte because its ionization in water is incomplete. By contrast, in a hydrochloric acid solution, the H+ and Cl- ions have no tendency to recombine to form molecular HCl. We use the single arrow to represent complete ionizations. Thanks for reading Explanation About Electrolytes versus Nonelectrolytes. Please share...! 0 Comment for "Explanation About Electrolytes versus Nonelectrolytes"